Direct action lavatory cisterns are considered more reliable that the older Burlington bell style and can be used for high level, low level and close coupling positions. The cisterns are normally made from either ceramic or plastic. The down pipe to the lavatory pan is attached to an invert U pipe in the cistern, the other end of the U going to a reservoir at the bottom of which is a perforated disc covered by a flexible material (the flap valve) with a vertical rod attached to a lever mechanism. When the vertical rod is moved upwards (either by chain or handle action), the perforated disc lifts the water in the reservoir over the top of the inverted U and down the pipe to the pan. Once the water starts down the down pipe, a syphon effect is created causing the rest of the water in the cistern to be pulled over the U to flush the lavatory. The water is drawn out of the cistern until air is drawn into the reservoir. When the cistern is emptied, a weight on the top of the perorated disc pulls it down and the flexible material covering the disc allows the reservoir to refill as the cistern itself if refilled. Some modern cisterns have both half flush and full flush operations to economise on the water used; push the handle and hold it down for a full flush or push the handle down and release for a half flush. Typically these cisterns have a large aperture where the vertical rod goes through the top of the reservoir. When the handle is pushed down and held, a seal on the vertical rod seals the aperture so that the syphon effect pulls all the water into the down-pipe until air is drawn in at the bottom of the reservoir. 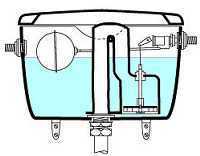 When the cistern is flushed by pushing the handle down and releasing, the syphon effect only pulls through the water until air can enter the top of the reservoir around the vertical rod. Setting the water level - if it is too low, there won't be sufficient water in the reservoir to start the syphon effect. The linkage to the disc lifting rod can become detached from the handle or chain rocker. The flexible material covering the perforated disc (the flap valve) can become worn - the result is then that water will not be raised to the top of the inverted U when the rod is lifted as water passes back through the worn flap valve and the cistern will fail to flush. The flexible material can however be replaced returning the cistern to 100% efficiency. 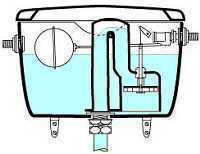 See this page for how to replace the flap valve.